Following in his father's footsteps, helping people is his main goal. Peter has been working at Triangle since he was 13 years old, when he start on the bottom rung of the ladder. As a teenager you could find Peter cleaning up, painting the building, putting away stock and helping with all phases of service station facility maintenance. A high school graduate of Lawrence Academy in Groton, MA., he then went on to Ithica College, Ithica, N.Y. and ultimately received his Marketing degree from Fitchburg State. 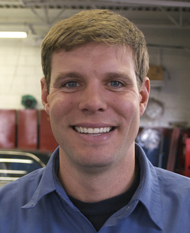 Since college, Peter has been working as a technician mastering the ins and outs of the auto repair business. Educational classes come easily to Peter and he enjoys the new and interesting diagnostic methods used in solving the drivability concerns of the modern day vehicle. He is also well versed in hybrid vehicles. 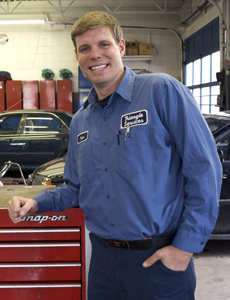 Peter is ASE certified holding an L1 rating, is a Registered Repair Technician for Massachusetts Vehicle Check, is a Licensed State Inspector, as well as a Certified Air Conditioning Recovery, Repair, And Recharge Technician. Along with all his certifications he actively pursues at least one automotive class a month after work and on weekends to stay abreast of the ever changing modern automobile. There are not many questions Peter will not be able to answer about your automobile. top quality auto repair & truck repair service. When Peter isn't diagnosing and fixing vehicles, he enjoys fishing & spending time with his wife Jackie, son Trevor and their two dogs: Grumpy and Winnie.